Someone types into Google “how to make money from my blog” and your article pops up. 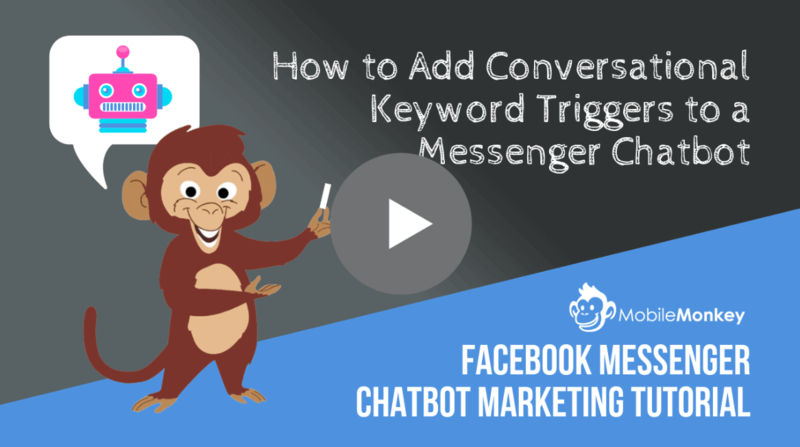 You have the best advice out there and the reader has fallen in love with your content. The next thing they’re going to do is click your About section. They want to get to know the person behind the blog post. This is where they will determine if you’re worth the subscription and the precious space in their email box. 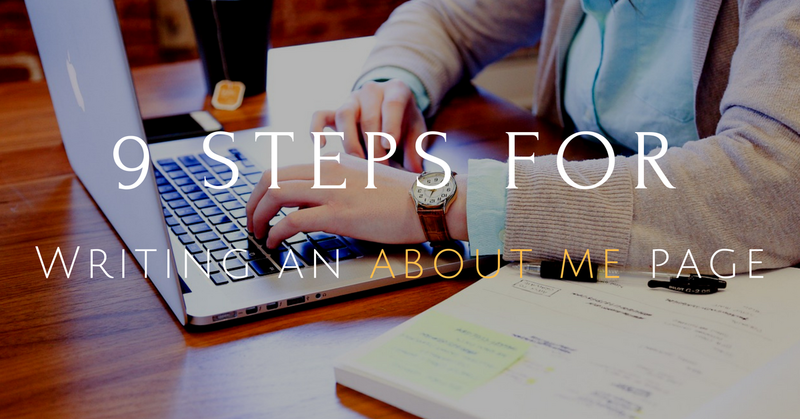 So, how do you create the perfect About Me page so that your readers can see your value? Well it’s not a strict formula that works the same every time it’s used; you have to be creative with it. However, there are certain elements that you can include to make it great. If you’re running a fashion blog and your About Me section uses computer lingo, you obviously don’t know your audience. Picture your blog from their point of view. What is my demographic? What can they determine from my About Me page? Does it accurately reflect what I have to offer? Welcome. Minimalist Baker is a website devoted to simple cooking. All recipes require 10 ingredients or less, 1 bowl or 1 pot, or 30 minutes or less to prepare. Right away we know that this blog is about simple recipes with simple ingredients and simple steps. Your About Me section is all about you right? ... Wrong! You want to show your readers what value they will receive from your blog. 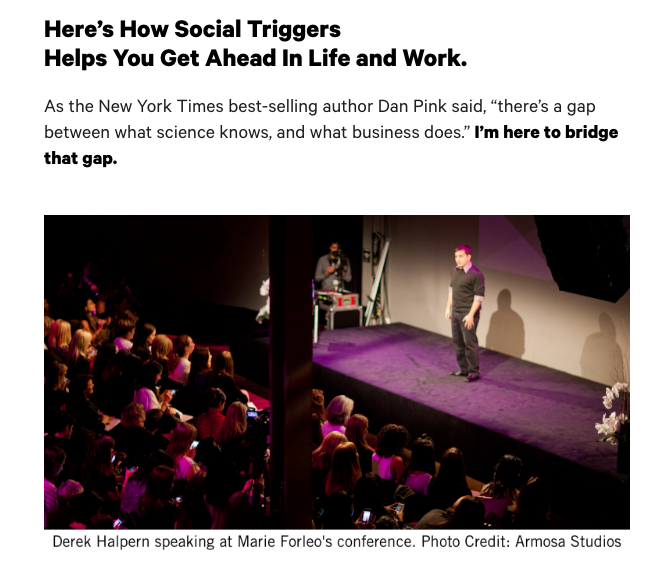 Derek Halpern, tell his readers how his blog, Social Triggers, can help them get ahead in life and work. Think of your About section as an interview. Include relevant points that tell the readers how your life relates to your topic. Why did you start blogging? Did some life event occur that made you want to blog? Could it be a trip to Asia and you felt inspired so you decided to start a travel blog. How do you know so much about your niche? How did your career lead up to your blog? You can include the number of years of experience in your field or list some of the big sites that you have been featured on to show your credibility. Anything from guest posts, interviews you have done or reviews of your work. 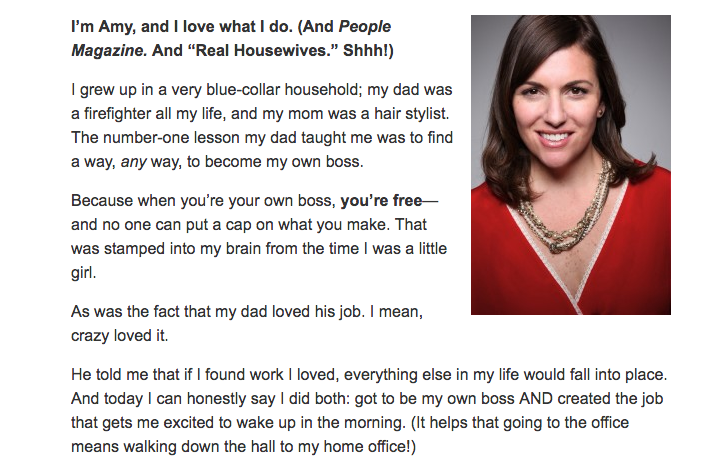 Amy Porterfield's About Me page is a great example of how to tell your story in a relevant and meaningful manner. She highlights how growing up in a household where both her parents loved their jobs so much that it pushed her to do what she loves. And that was to become her own boss and start a business. Amy now runs a business helping small business owners learn how to be successful. It’s important to include personality traits that are relevant to your topic. Again, in an interview you want to highlight the parts of your personality that showcase why you’re a perfect fit for the job. What is it that makes you perfect to talk about your niche? Marlin Jackson keeps his About Me section relevant and personable. He highlights how he pays attention to details and loves to learn. These are great traits for a designer who needs to notice the small things and keep up to date with the recent design trends. Today’s blog reader is looking to connect with you on a personal level. It’s important to give them a peak into what your “real” life is like. Do you have kids, pets, a partner, etc.? What are your hobbies? Where do you live? Make sure not to go too go into too much detail. The reader cares, but not that much. Make-up artists Heather Contan’s About Me page features not only her love for make-up but also for documentary films, photography, tattoos and time with her husband and pet beagle. Encourage your readers to take action. 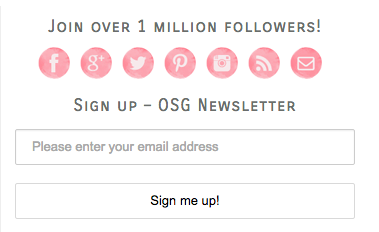 This could mean asking them to subscribe, buy, share, like or follow your blog, book, website, Instagram, Facebook, etc. CTA’s guide them to the right place where they can stay connected and engaged. Pro Tip: Include CTA’s throughout the About Me section, just in case they don’t read the entire thing. 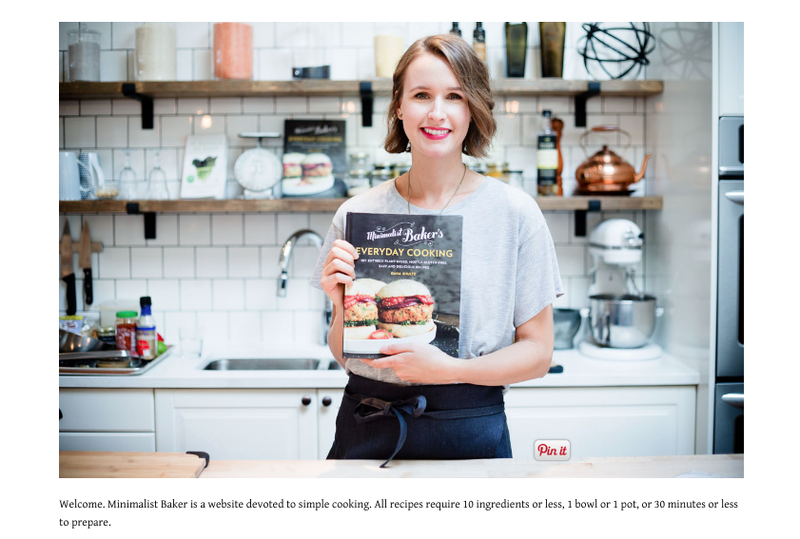 Oh She Glows, a food blog by Angela Liddon, asks readers to sign up for her newsletter. Photos and videos: Visual content is the best way to engage readers. If you show them a picture of you or a 1-minute About Me video they will feel like they know whom they are going to be working with right away. 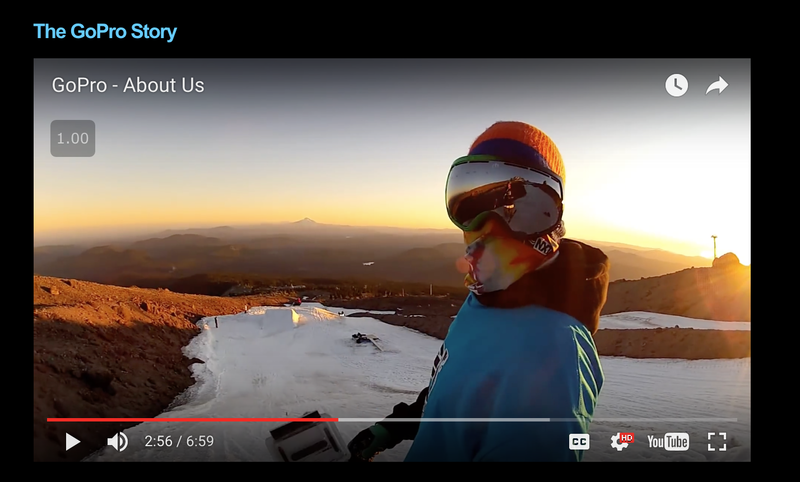 The camera company GoPro tells their story through a creative video. The writer of Made By Water Jordan Vitanov uses two pictures in his blog to show both sides of his personality. Projects: Provide a link to your best posts and projects. This is the best way to show them what you do (while getting to brag a little). Social Media: Provide links to all your other social media pages so they can get a well-rounded view about what you do. Contact Information: It’s important to let your readers know that you are not just some mythical creature on the Internet. Provide contact information so that they can reach out to you for any further inquiries that they may have. At the end of MonetizePros About page, our editor reiterates that if readers are having any issues they should feel free to contact him. Like I said above, designing an About Me section isn’t just about following a formula. You have to be creative and have fun with it. Make sure to add personal touches so that your audience can get a real feel for what you’re about. 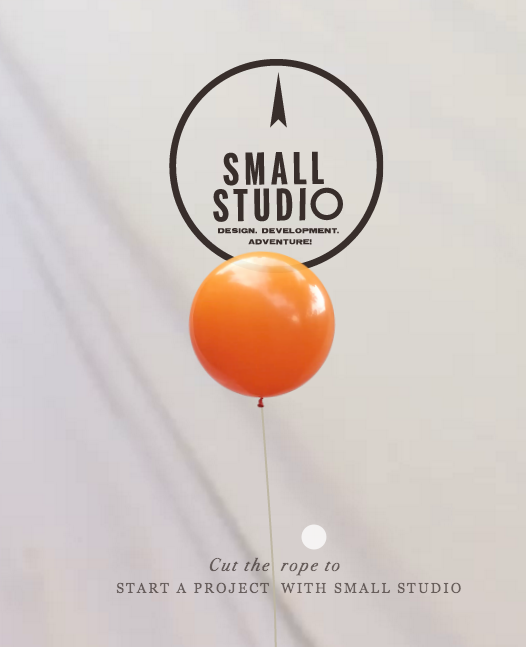 Small Studios, a design and development blog, has an About Me section that is beautifully designed to showcase exactly what they can do. Take your time writing your About Me page. It is the heart and soul of your blog after all. Loud and clear: Make sure you’re clear about what your blog is about and what you can offer your readers. Concise: No one wants to read a large block paragraph about your teen years. Keep your writing short and simple. 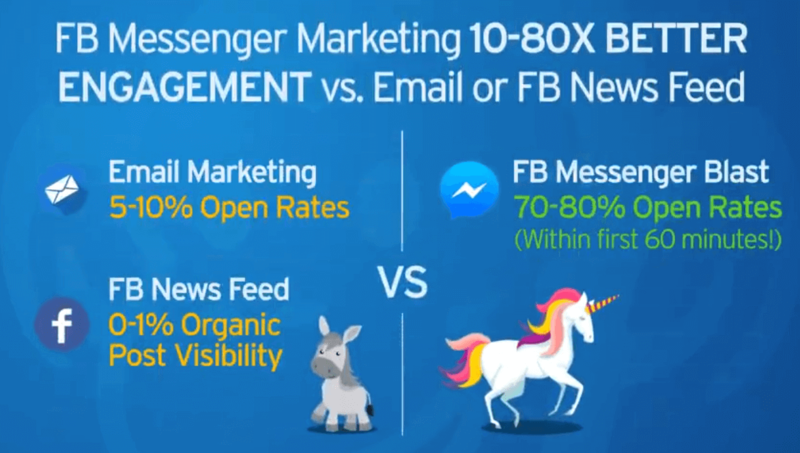 Charming: You want to leave your readers wanting more. Woo them with your words. More Examples of Fun and Creative About Me Pages. 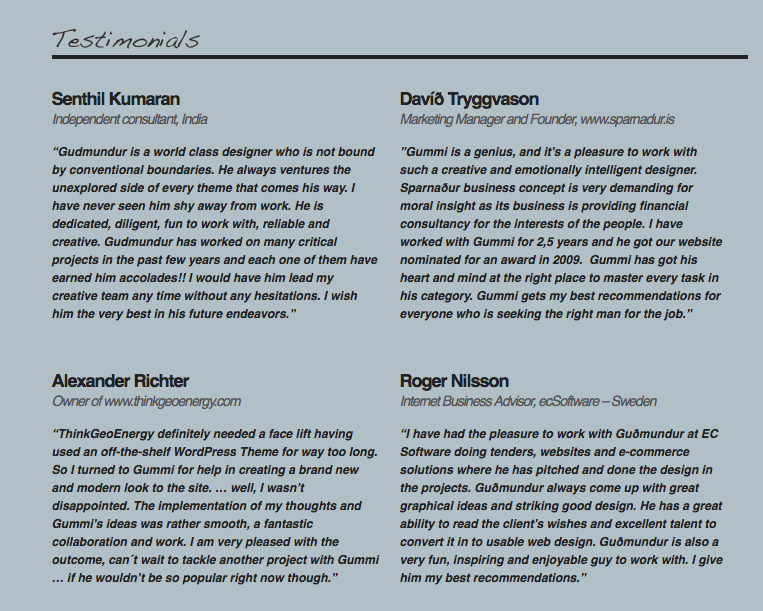 Gummisig includes testimonials from previous professionals that he has worked with to boost his credibility. 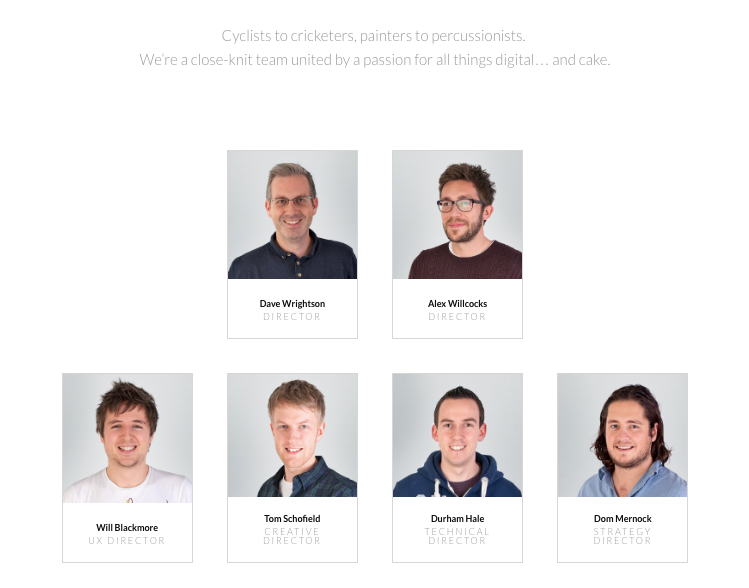 Engage Interactive lists all their employees and gives each of them an About Me page. 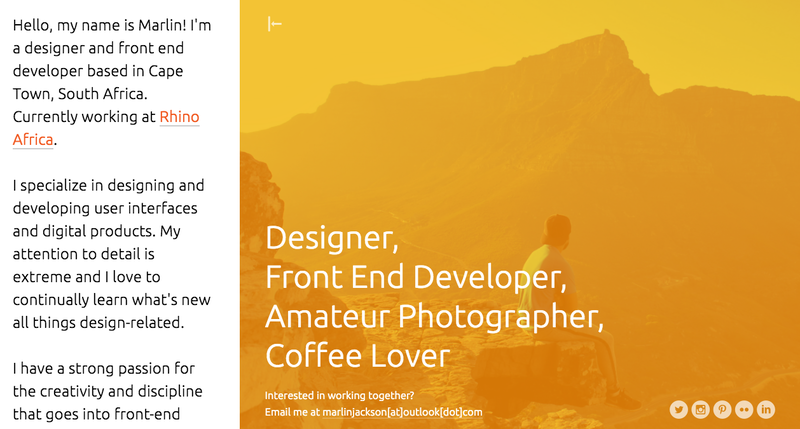 Joseph Payton lets you decide if you want to learn about his story or his resume. Miki Mottes doesn’t just tell us, but shows us that he is an illustrator, animator and designer. 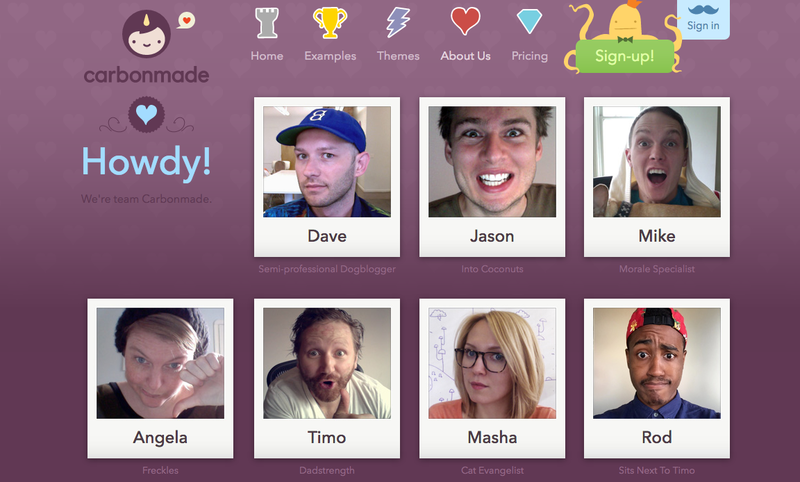 The same goes for Madwell and their team’s creative and hilarious pictures. Filling in this template is a great start for your About Me page. It covers all the essential questions you should ask yourself before you begin writing. What can they determine from my About Me page? What value do you bring to your readers? What kind of writing are they looking for? What experience do you have that is relevant to your niche? How do you know so much about your niche? How did your career lead up to your blog? What parts of your personality are relevant to your niche? What project and achievements have you obtained that are relevant to your niche? What is your personal life like? Do you have kids, pets, a partner, etc.? What action do you want your readers to preform? As a professional about me page is really important. I really like your way of blogging. I book-marked it to my bookmark site list and will be checking back soon.